According to data gathered by Benchmark Commercial Real Estate (BMCRE) in Arizona, the amount of square footage approved for potential cannabis cultivation massively exceeds what the current medical marijuana – or even the future recreational – in-state market will bear. The state already has just over one million square feet of built-out cultivation facilities, which equals an approximate production capacity of 106,000 pounds of cannabis per year. Yet in 2014, Arizona’s 60,000 registered MMJ patients only bought approximately 20,000 pounds of cannabis — less than a fifth of the current production capacity. Public records indicate the current facilities are just the tip of the iceberg. More than 26 million square feet of land in Arizona are approved for cannabis cultivation. If all were to be used, it would yield about 2.6 million pounds per year. 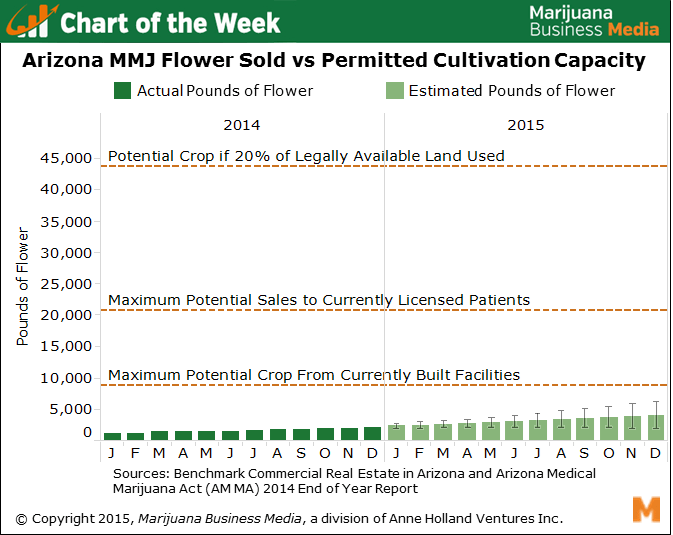 To put that in perspective, Arizona’s MMJ maximum sales potential, with each patient buying their fully allowed 2.5 ounces every two weeks, is roughly 250,000 pounds per year. Arizona could potentially pass a recreational retail ballot measure in 2016. However, this would only increase the total statewide cannabis market by perhaps 50%. For example, Colorado’s recreational and medical sales added up to just less than 150,000 total pounds of flower in 2014. So, even if Arizona’s total market grew to match Colorado’s, producers would be able to meet statewide demand with only 500,000 square feet of production facility build-outs in addition to the facilities that are already built. It’s important to note that just because 26 million square feet of commercial real estate are approved for cannabis cultivation, it doesn’t mean they will all be used. In fact, most will not. That said, this easy availability could entice investors and entrepreneurs to invest in far more production capacity than is needed. This is especially possible because Arizona’s Department of Health Services does not release data on cultivation locations or square footage, thus making market research more difficult. As recent woes in Washington State amply illustrate, nobody wins when surplus crop floods the market. Over-supply causes price volatility, harms grower and retail profitability, and makes business budgeting challenging. Plus, surpluses may potentially wind up on the black market in-state or sold across state lines. The cannabis market will inevitably be volatile for years until market forces finally balance supply with demand. It would be perfectly fine if in the beginning there is an oversupply or undersupply. If the government stays out of the way, the businesses will eventually correct themselves.